Donald Trump must really want to be president. Because he is letting his brand take a beating. 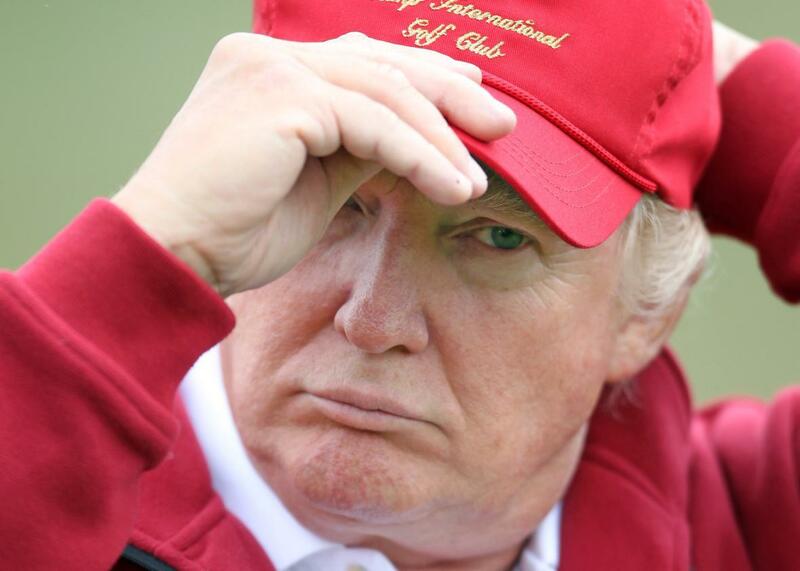 Donald Trump during the opening of The Trump International Golf Links Course on July 10, 2012 in Balmedie, Scotland. Remember when Sen. Barack Obama campaigned as No Drama Obama? Donald Trump is following the opposite strategy. There’s no fracas he won’t join. When he’s not defending his characterization of Mexican immigrants as rapists and murderers, he’s exchanging charges of racism with op-ed writers, slagging his opponents, and launching counterstrikes against companies who abandon him. When there were reports that Republican National Committee Chairman Reince Priebus called him to tell him to tone down his comments about Mexico because it was hurting the party’s image, Trump took to Twitter to rebut press characterizations. Occasionally voters give presidential candidates the single-finger salute for blocking traffic in primary states. You can imagine Trump stopping his motorcade to return fire. This isn’t the normal behavior of a presidential candidate—which is exactly the ticket that Trump is running on. He’s not a candidate; he’s a brand. He has exchanged the normal politician’s clichés for clichés about his high-end real estate holdings. He can’t mention one of them without testifying to its luxuriousness—the “magnificent ballroom at Trump National Doral in Miami,” or his golf course in Los Angeles that’s “perhaps the most valuable parcel of land in all of golf.” Because his company’s name is his name, his campaign placards are also marketing material for his fine and luxuriant properties, which are the envy of discerning travelers accustomed to high thread-count amenities. But the brand is taking a hit. It’s not just that companies are leaving him because they don’t want to be associated with someone so offensive. One of the latest is José Andrés, the D.C.–based chef with a growing national brand, who dropped a deal to open the flagship restaurant in Trump’s Washington hotel on Pennsylvania Avenue. What’s happening now is that companies find it profitable, or at least to their public relations advantage, to get in the news cycle for abandoning Trump. In a recent Trump press release, the tycoon calls out NASCAR and ESPN for making a big story about dropping their relationships with him. “The disassociation of ESPN and NASCAR with the Trump Organization was covered by the press in headlines all over the world as though it was a major setback for me. Really? What were the losses?” he asks. He then goes on to say that all he lost were commitments to use one ballroom and a golf course. Puny stuff, he argues, though not so puny that he doesn’t take the chance to point out that he’s pocketing the deposits for each cancellation and making money off the properties now that they are freed up. “I get two fees instead of one,” he boasts. Shouldn’t Trump, the consummate marketer, know what’s going on here? People are willing to boast about abandoning their associations with him no matter how small because the bandwagon is rolling and they want to do the cool thing. It’s so hip to drop Trump, it’s amazing that it didn’t start in Brooklyn. He’s pocketed some extra cash, perhaps, but surely as a born salesman he knows that the expense that can’t be tallied on a bill of sale is that his name is becoming something people flee from. With each new divestiture, no matter how small the underlying deal, it cements this image. This isn’t about votes. There is a group of Republican voters who like what Trump is saying, how he says it, and don’t mind that the political clowns are being ruffled by this party-crasher. So the controversy could help Trump in a limited way politically. Still, his chances of becoming president are less than infinitesimal. However, he will still be Trump the brand after the race is over. He’s rich, so he can suffer the blow to his brand. Maybe he can withstand becoming toxic for a little while. If that’s so, we’re getting a sense of just how committed he is to this political venture. There’s nothing in his behavior that suggests he takes slights to his brand lightly, no matter how bulging his bank account is. That’s the key to his success! So if he’s willing to endure the pain, he must have a higher level of commitment than his detractors thought. Though the political class may not take his candidacy seriously, the fact that Trump is willing to let his business brand be tarnished in the service of his campaign is a sign that at least he takes his candidacy seriously.